For safety reasons, switch off the wipers and remove the SmartKey from the starter switch before replacing a wiper blade. Otherwise, the wiper motor could suddenly turn on and cause injury. Never open the hood if a windshield wiper arm has been folded away from the windshield. Hold the windshield wiper arm firmly when you change the wiper blade. If you release the windshield wiper arm without a wiper blade and it falls onto the windshield, the windshield may be damaged by the force of the impact. ► Remove the SmartKey from the ignition lock. ► Fold wiper arm 1 away from the windshield until it engages. ► Position wiper blade 2 horizontally. ► Press locking spring 3. 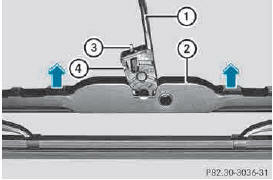 ► Slide wiper blade 2 with hinge piece 4 from wiper arm 1. 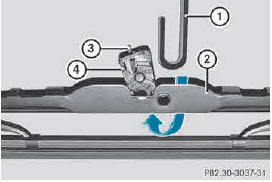 ► Slide new wiper blade 2 with the recess onto wiper arm 1. ► Engage locking spring 3 into the end of the wiper arm. ► Make sure that wiper blade 2 is seated correctly. ► Fold wiper arm 1 back onto the windshield.